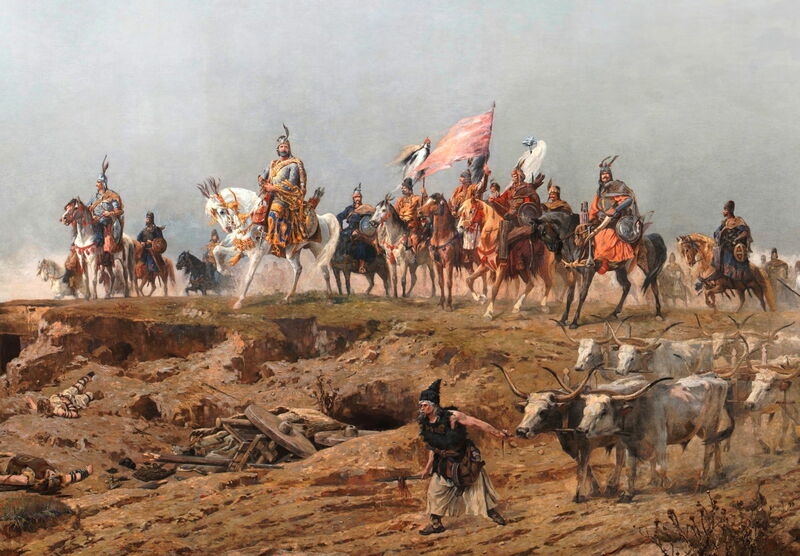 Árpád Feszty (1856–1914), Arrival of the Hungarians (Feszty Panorama) (detail) (1892-4), oil on canvas cyclorama, 1500 x 12000 cm, Ópusztaszer National Heritage Park, Ópusztaszer, Hungary. Wikimedia Commons. During the 1800s, most western cities increased greatly in size, and the scope for exploiting paintings for commercial gain increased concomitantly. The population of Paris grew from just over half a million in 1801 to nearer three million by 1901, and London grew from one million to nearly seven million over the same period. By the middle of the century, the Paris Salon could attract as many as 50,000 visitors per day, with a total of as many as a million visitors in its better years. Sales of prints and illustrated books also soared, particularly among the growing middle classes. I have always been unhappy with the tendency of ‘artists’ to use the word illustration as a disparaging term for works which they consider lack the qualities of ‘fine art’, particularly as it has proved impossible to define key terms such as art and illustration. This becomes even more of a problem when considering narrative works, so here I will rely on the following functional distinction. Graphical representations (including paintings, drawings, prints) of narrative will here be deemed to be illustrations when the artist has intended them to accompany a copy of the written text (or similar) of the narrative; when the artist has intended the graphical representation to stand alone, possibly with the support of an informative title and a short excerpt of poetry or similar, then they will not be deemed to be illustrations, but separate works of art. For example, many paintings and illustrations have been made of John Bunyan’s allegorical novel The Pilgrim’s Progress (1678); if you are unfamiliar with its history or narrative, Wikipedia has an extensive article here. Among the more famous illustrated editions is that of William Blake, dating from 1824-27, an example plate being shown below. William Blake (1757–1827), The Man Who Dreamed of the Day of Judgement (1824-7), Plate 13 in John Bunyan’s The Pilgrim’s Progress, ill. William Blake. Wikimedia Commons. 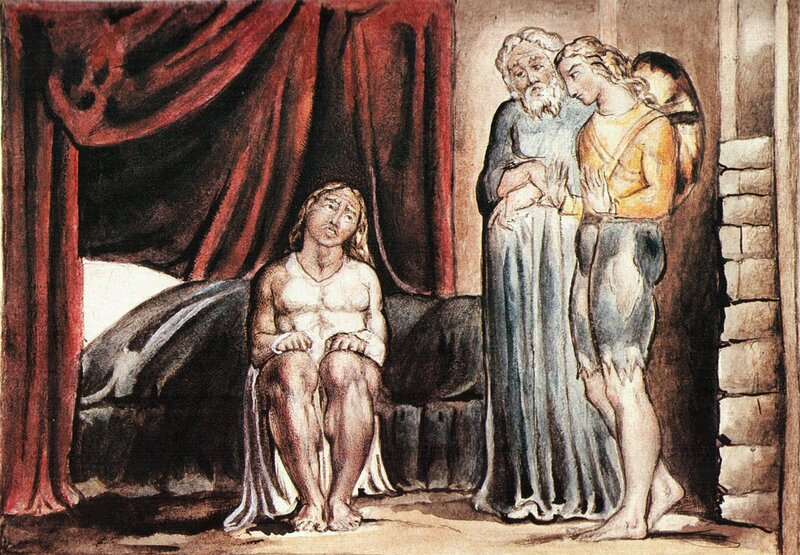 Blake intended this as a complete illustrated edition of the book, and however artistic his watercolours might be, they rely on the text narrative which accompanies them. 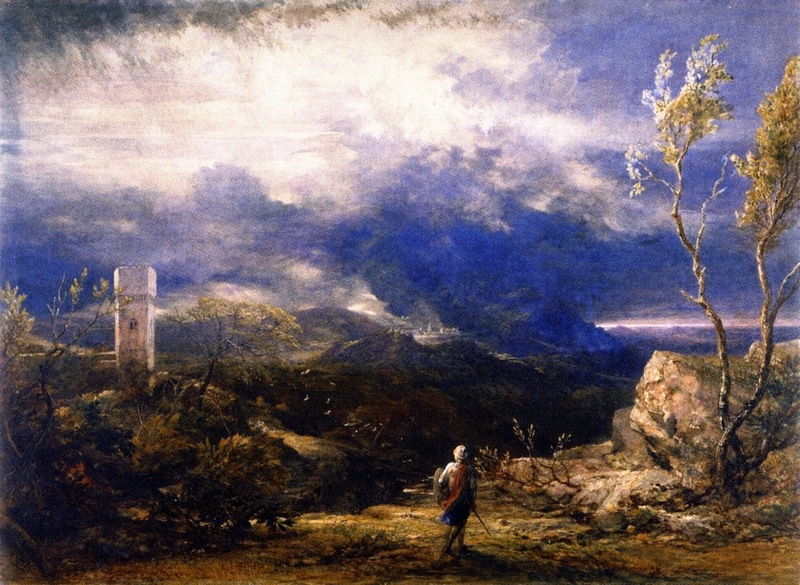 However Samuel Palmer and other painters made standalone paintings (and other graphical art), such as Palmer’s Christian Descending into the Valley of Humiliation (1848), below. Whilst they cue the textual narrative in title and content, they are narrative paintings rather than illustrations, in this context. I have already given an account of the history of painted panoramas here and here, which almost exclusively showed landscape (or cityscape) views at first. Paul Dominique Philippoteaux (1846–1923), Gettysburg Cyclorama (1863), oil on canvas panorama, overall 820 x 10940 cm. Gettysburg Museum and Visitor Center, Gettysburg, PA. Wikimedia Commons. During the 1800s, they were developed to include more narrative works, particularly depictions of epic battles, and are still used occasionally to commemorate important battles. 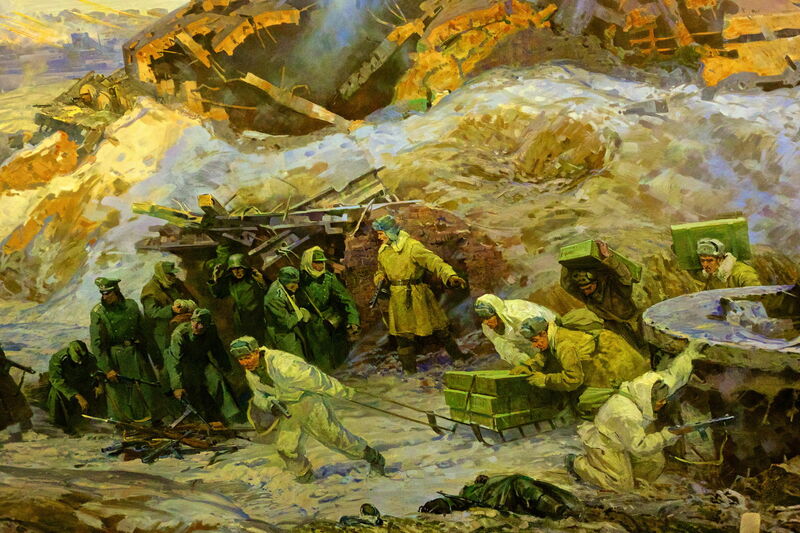 The rout of the Nazi troops in the Stalingrad Battle (detail), Volgograd Panorama Museum, Volgograd, Russia. Photo by Edmund Gall (2013-08 Russia 102), via Wikimedia Commons. Even at the end of the 1800s, as their popularity was waning, Árpád Feszty and a hoard of assistants depicted the narrative scenes they imagined of a millenium earlier, as the first Hungarians arrived to settle their country. Full-size panoramas required a lot of space, and sometimes purpose-designed buildings, but in 1821-2, Louis-Jacques-Mandé Daguerre (1787-1851) invented the diorama. This is the same Daguerre who less than twenty years later invented the daguerrotype process in photography, and was a professional panorama painter. Being considerably less demanding on space and resources, dioramas quickly became widespread and very popular, and included a wide range of narrative subjects. At about the same time, the moving panorama was invented in the UK. Rather than display a very long painting statically, moving panoramas put the painting on a flexible fabric support, and moved the image past the spectators. Although these became popular in Europe, they were most successful in the US, where a scene painter named John Banvard made them spectacles for the Broadway theatres in New York, and grew rich as a result. In the 1840s and 1850s, moving panoramas were all the rage, showing scenes along the course of the Mississippi River, voyages around South America to California’s gold rush, Arctic explorations, and a whaling voyage around the world. Most of these had some form of underlying narrative, but it was usually very simple, such as the timeline of a journey. Benjamin Russell & Caleb Purrington, Grand Panorama of a Whaling Voyage Around the World (detail) (1848), painted panorama on cotton, approx 260 x 38900 cm, New Bedford Whaling Museum, New Bedford, MA. Wikimedia Commons. 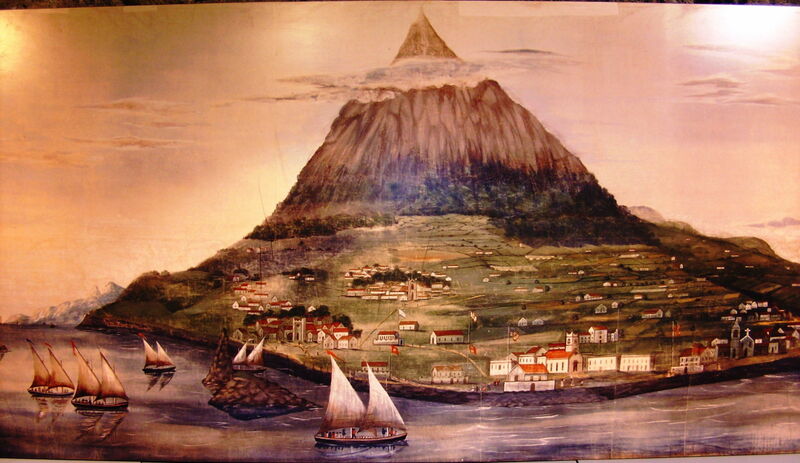 The most prominent exception to that is The Moving Panorama of Pilgrim’s Progress (1851), recently restored and on show at the Sacco Museum. In over 240 metres (800 feet) of fabric painted using distemper – as would have been used for theatrical scenery, for instance – it shows the complete narrative of John Bunyan’s book The Pilgrim’s Progress, in a very different way from Blake’s illustrations. In reality, a moving panorama is nothing of the kind, but rests somewhere between painting and illustration (even by my definition above). When shown to their spectators, they were in effect a series of still images presented in strict sequence, a bit like a modern slide presentation. The fabric on which they had been painted would be periodically advanced, then stopped, whilst a narrator told the viewers the narrative of that particular section of the image. This was often accompanied by live piano music. So although they are in effect a long series of conjoined narrative paintings, they were as reliant on an oral account of the story as book illustrations are on their printed text. The Sacco account of the Pilgrim’s Progress is, like Blake’s printed version, also a work of art in its own right, though. John Banvard may have been a second-rate amateur painter, but those who created the moving panorama of Bunyan’s book included some of the leading landscape painters in the US, such as Frederic Church. The Moving Panorama of Pilgrim’s Progress, Saco Museum, Saco, ME, with the 33 minute video here. A Panorama of Mormon Life, Museum of Church History and Art, Salt Lake City, UT. The Garibaldi Panorama, Brown University Library, Providence, RI. Grand Panorama of a Whaling Voyage around the World, New Bedford Whaling Museum, New Bedford, MA. The Panorama of the Monumental Grandeur of the Mississippi Valley, Saint Louis Art Museum, St Louis, MO. In the midst of all the other problems faced by narrative painting in the 1800s, it was also transformed into mass entertainment. In this it relied on accompanying oral narrative (and narration), and became a curious mixture of conventional painting, the graphic novel (comic strip, etc. ), and a crude mechanical precursor to the movie. By 1910, panoramas, moving or static, had faded into history as the western world was swept by movies. It looked as if narrative painting was also dead and gone. Routhier, JS, Avery KJ & Hardiman, Jr, T (2015) The Painters’ Panorama, Narrative, Art, and Faith in the Moving Panorama of Pilgrim’s Progress, UP of New England. ISBN 978 1 61168 663 0. Posted in General, Painting, Technology and tagged Blake, Bunyan, Feszty, Gettysburg, illustration, narrative, painting, Palmer, panorama, Pilgrim's Progress, Sacco. Bookmark the permalink.